There is no explicit right to vote in our Constitution. States, counties and voting districts decide on voter ID laws, ballot designs, whether convicted felons or students can vote, and where polling places will be located. 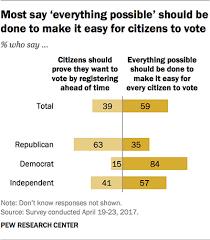 Politicians have been known to put restrictions in place that will favor candidates they prefer, and deny the right to vote to millions of people who are more likely to vote for the opposition. The Constitution could be amended to provide all citizens of voting age with an explicit right to vote. Laws could be written at the national level to specify voting rights and requirements that states must follow. There are also ways to make voting easier such as automatic voter registration or voting by mail.